Lovely open fire and logs can be supplied, starter pack provided. A new 42 inch television Open plan with a sofa to seat 3 persons comfortably and two to three other single arm chairs which includes a suitable chair for anyone who has difficulty getting off a chair and foot rest provided. Gas hob, Rangemaster electric oven, with extractor fan, fridge and freezer. microwave and well equipped dinning/kitchen utensils. Dining table in the open spacious living kitchen, table looking out to glorious countryside with a bird table on view, you just won't stop looking at the bird feeder. Golf course nearby, Friendly and fun suitable for the less discerning golfer. Golf and buggy hire. Special family rate £60 per week. Golf lessons can be arranged. Notes on accommodation: £15 Gas central heating and hot water allowance per week usually more than enough. Mill has a Condensing boiler Meters read on arrival and departure. Sorry no children under 8years and no pets. And no smoking property Outside: Large patio and south facing sheltered wall garden & outdoor furniture, barbecue all provided. A bird table and a Wood pecker is a favourite visitor and many other pretty birds. Utility Room: Excellent drying room with washing machine and sink and plenty of coat hooks Linen is included and towels . Other: The gallery sitting room upstairs has lovely extending views includes a table and chairs and chest of games and puzzles. Great property, very spacious and lovely garden. Good location, short easy drives to lots of places. I stayed with my parents, husband and two children and found it great as there was plenty of space, ensuite bathrooms and the garden was perfect as it was enclosed. Lovely to be located in the countryside with great views, quiet and peaceful. Thank you for taking time to add such a wonderful review. It is always good to know our guests have enjoyed there stay. Our main reason for booking Dimpleknowe Mill was due to this property having a ground floor bedroom and bathroom with excellent facilities for a disabled guest. The bathroom includes a wet room fully equipped for disabled use large enough for a wheelchair. The whole of the downstairs accommodation is wheelchair friendly. We also required separate accommodation for our son and his family. This property has on the upper floor two bedrooms each with bathroom facilities. There is also a spacious lounge offering extra privacy. This provided them with a self-contained unit. 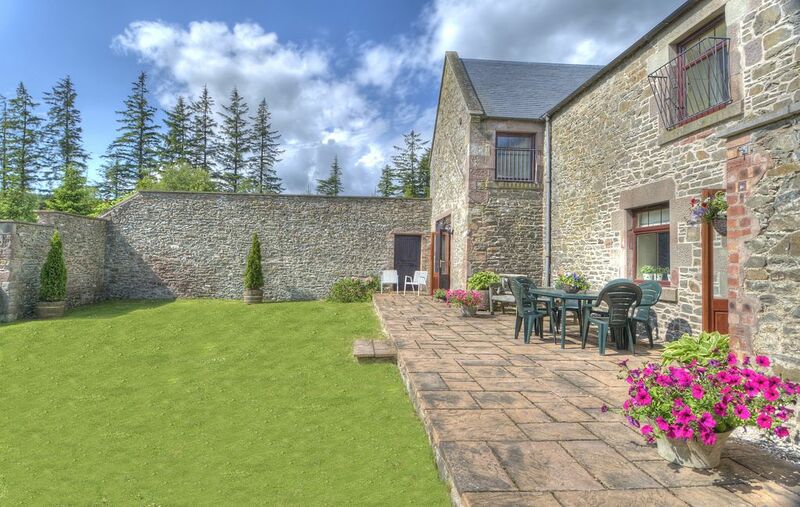 The location, very close to Hawick, is perfect for visiting the many Border County properties and various attractions. The property itself is in a very quiet location and has an attractive secluded garden. The owner, Jane, is very helpful and provides valuable local knowledge of places to visit within the area which is a bonus. Thank you so much for your lovely review which provides excellent information for future guests, especially the disable facilities and upstairs bedrooms and extra sitting room. Just so pleased you all enjoyed your visit. This property is wonderful! The pictures do not do it justice...great layout, very clean and well maintained and gorgeous location. Ten minute drive to Hawick(grocery stores, gas station, nice museum) and easy drive to Abbeys and other Borders sites. Jane and Norman were delightful hosts. We especially enjoyed walks down the lanes, bird watching(loved the pheasants) and the 11 hole golf course. Recommend highly and hope to return one day. we found the property excellent for our requirements with all areas catered for and not to far from town but would be no good unless you drive . a sign of the main road would be very useful to direct you to the property. Spent a few days last week with my family in this very well maintained and comfortable house. Lovely log fire and very comfortable beds. Well stocked kitchen with everything needed. Jane was extremely helpful and has been doing her best to get speedier wifi, not her fault! Lovely to sit at the table and watch all the different variety of birds, many which I haven't seen for some time. A very relaxing and enjoyable few days in beautiful countryside. Thank you so much for your super review. So pleased you all enjoyed the countryside and surroundings of Dimpleknowe. Dimpleknowe Mill was exactly as described and we enjoyed and made full use of all the amenities mentioned by previous reviewers. The very accessible ground floor layout worked very well for the 87 year old member of our family. We were able to visit several of the local villages and towns and explore local castles and abbeys. The late summer weather gave us some beautiful sunny days and sunsets and just a little rain. Thank you to owner Jane for her hospitality. Online grocery shopping. Restaurants local with in 3miles. Cashmere sales in Hawick at certain times of the year. The Ian Stark Equestrain Centre suitable for beginners and hacking. Border towns within easy distance and Edinburgh just over an hour drive, or park and drive en route or take the local bus journey form nearby Ashkirk. Booking Notes: Payments are possible by BACS, cheque. Deposit of £100 is payable on booking. Final balance is due 4 weeks prior to arrival. Sorry, unfortunately we do not allow children under 8 or pets (unless guide dogs). Changeover Day: Changeover day is Saturday. Sometimes can be flexible. Arrival time 4pm and departure time 10am Notes on prices: Discounts are sometimes available for lower occupancy (1 or 2 bedrooms), from £550 to £650 per week not in high season rates. £15 to £20 Gas heating and hot water allowance included generally more than enough. Terms and conditions of let on www.dimpleknowe.co.uk please read and confirm you have read these and accept them.